I know I am biased, but doesn’t Marie look nice up there? There being the top 100 Free in the Teen & Young Adult Science Fiction & Dystopian Romance eBooks section of the ‘Zon. I am pleased to report that so far Marie has been downloaded in the following countries: USA, UK, Germany, Italy, Japan, Canada, and Brazil. If anything exciting happens, I’ll share with the blogosphere. The Broken Bargain Tour has officially started, and I am happy to announce that one lucky reader, Michelle Li, has won a copy of Marie’s Journey! Writing as J. L. Mbewe, Jennette is an author, artist, mother, wife, but not always in that order. Born and raised in Minnesota, she now braves the heat of Texas, but pines for the Northern Lights and the lakes of home every autumn. She loves trying to capture the abstract and make it concrete. She is currently living her second childhood with a wonderful husband and two precious children who don’t seem to mind her eclectic collections of rocks, shells, and books, among other things. While living life balanced between reality and dreams, she is creating worlds inhabited by all sorts of fantasy creatures and characters, all questing about and discovering true love amid lots of peril. For more information about her journey as a writer mama and all things creative please visit her blog. “With a curse, she will build an army. With the dagger, she will undo the last sacrifice. But first the sorceress must find the secret keeper. Torn from her homeland and thrust into a betrothal against her wishes, Ayianna learns her family has a deadly secret that now has her on the run. She joins forces with Kael, an embittered half-elf, and Saeed, an elderly High Guardian, to seek answers to her father’s death, the destruction of Dagmar, and the plains people’s bizarre behavior. 1. What was your favorite book when you were a teenager? 2. What was your favorite movie? It’s hard to remember when I watched what back then, but some of my favorite movies were ones that carried over from my childhood such as Labyrinth, Willow, and The Neverending Story. I also LOVED The Three Musketeers. 3. Did you have an actor-crush? 4. Did you already know you wanted to be an author? When I was eight, I knew I wanted to be an author, but it didn’t take long for that dream to be swept under a rug and forgotten. I still did a lot of writing as a teen such as journaling, poems, a few attempts on novels. 5. What is your favorite genre to read? 6. Do you write in that genre? 7. What do you like the most about writing YA? I love the coming of age aspect and the characters’ figuring out their identity and dreams, and discovering true love along the way. 8. What are you working on? I’m currently working on the second book in the Hidden Dagger Trilogy as well as a few short stories that will be released throughout the year, leading up to the second book’s release. No date set on that one yet. Thank you, Jennette! 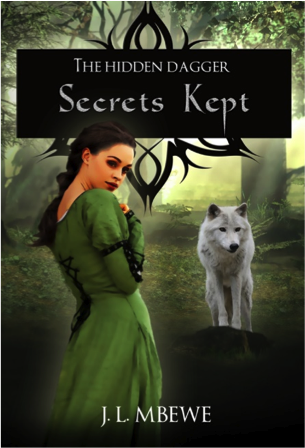 By the way, Secrets Kept’s cover looks amazing. Marie’s Journey, the fourth title in The Ginecean Chronicles, and my first young adult story, is officially out. Although I announced it the day it was published, life and other accidents got in the way of proper celebration. Usually, the holidays remind us of our loved ones who don’t walk on Earth anymore, but during those festive days I also lost a dear friend. I wasn’t in the mood to give my latest title the spotlight it deserved, and I let it gather dust for almost two weeks. Meanwhile, and despite my lack of enthusiasm, one copy was sold in Germany, and one in the USA. Today, I was reminded that publishing a book is never a solitary effort, and the people involved in its process should be properly acknowledged. Therefore, I wish to thank my awesome team, because without them my painstakingly written words would have never become a published novel. So, here they are: Amy Eye, my editor; Cassie Kelley McCown, my proofreader; Alessandro Fiorini, my cover artist; and Roberto Ruggeri, my strongest supporter, knight in software armor, and formatter. Grazie mille. 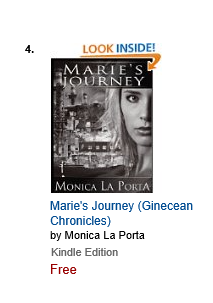 Marie’s Journey, the fourth book in The Ginecean Chronicles, and my first young adult title, is out. The core of this novel was written during Nanowrimo 2012, and since then it has changed title several times. The original idea was to depict what happened between the last two chapters in The Priest, but the character of Marie, a young fathered woman, demanded a different story. So, while I was writing this book, titles changed to reflect the overall atmosphere of the novel. The City of Men became Journey to the City of Men, and finally I surrendered to the evidence that I was never going to center Marie’s story around the City of Men’s wars, and I decided that the best title would be Marie’s Journey.